The paper is titled, "Determining the Pharmacokinetics of Nicotinic Drugs in the Endoplasmic Reticulum Using Biosensors." Co-first authors are Amol Shivange, formerly a Caltech postdoctoral scholar and now at Novozymes in Bangalore; Philip Borden of Janelia; and Caltech graduate student Anand Muthusamy. In addition to Lester, other authors are Caltech postdoctoral scholars Aaron Nichols, Kallol Bera, Matthew Mulcahy, and Saidhbhe O'Riordan; Huan Bao and Edwin Chapman of the University of Wisconsin; Ishak Bishara, a former intern in the Lester lab; former Caltech undergraduate Janice Jeon (BS '18); Bruce Cohen, a senior scientist in the Lester lab; Charlene Kim, research technician assistant in the Lester lab; Dennis Dougherty, the George Grant Hoag Professor of Chemistry at Caltech and director of the Beckman Institute; Jonathan Marvin of Janelia; and Loren Looger of Janelia. 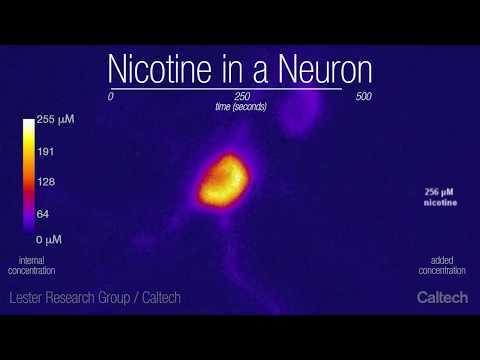 Funding was provided by the National Institutes of Health, the California Tobacco-Related Disease Research Program, the California Institute for Regenerative Medicine, the Brain & Behavior Research Foundation, HHMI, the Della Martin Foundation, Louis and Janet Fletcher, and Caltech Summer Undergraduate Research Fellowship donors.